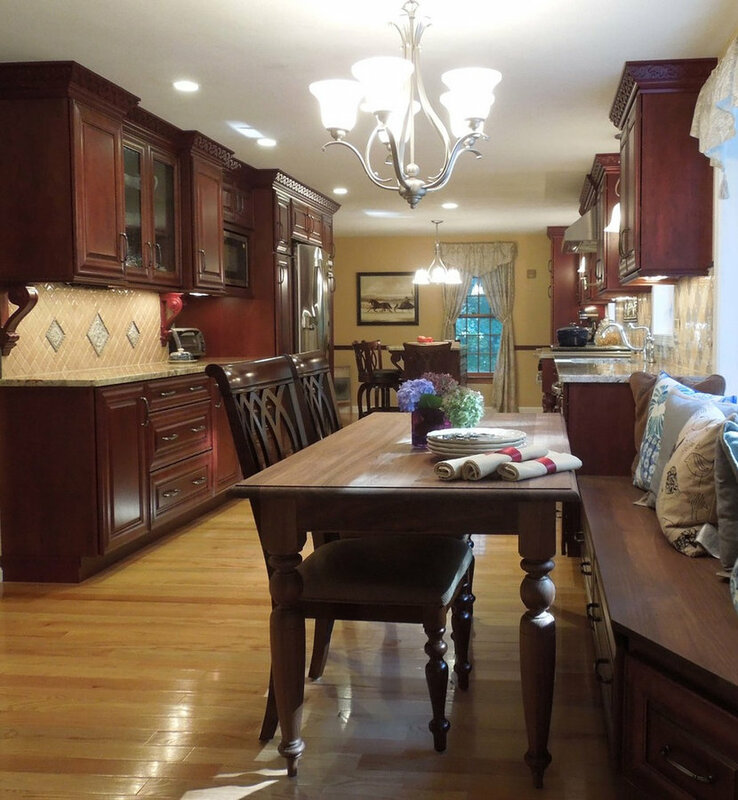 This Derry, NH galley kitchen features cherry cabinets in rich tones with dramatic baroque crown molding and stainless steel appliances. 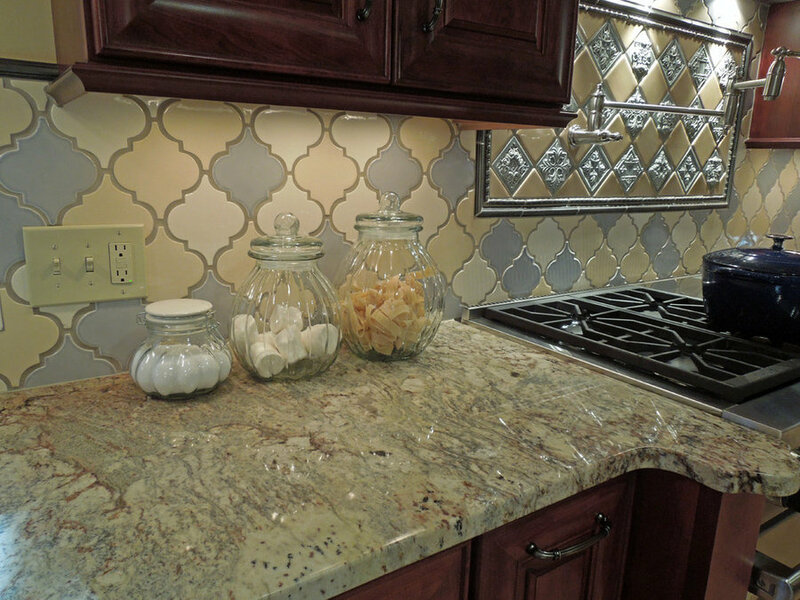 The arabesque tile back-splash in three colors is highlighted by unique feature areas over the range and at the buffet area. The client collections are displayed in open shelves and behind seeded glass doors. Seating at the banquette is on a walnut bench over deep drawers. The table is also walnut while the granite island features additional stools for helpers or friends. Delicious Kitchens & Interiors, LLC Island and counters feature Sierra Bordeaux polished natural granite while the cabinetry is cherry. 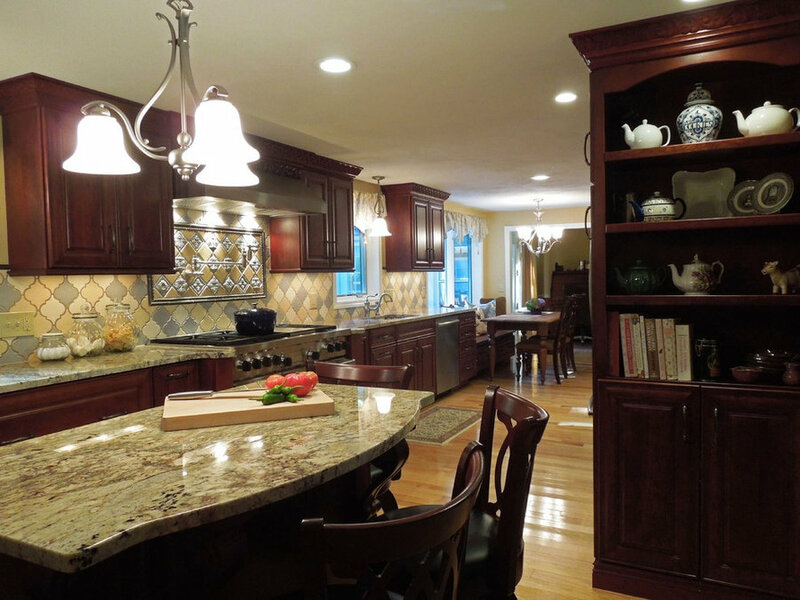 Delicious Kitchens & Interiors, LLC A lovely kitchen in Derry, NH is perfect for the couple who love cook and entertain. The walnut table and custom banquette bench provide comfortable seating for six or eight. The 48" range has 6 burners plus a griddle and two ovens. Delicious Kitchens & Interiors, LLC Storage... and then some in this spacious galley layout in Derry, NH. Cabinetry is stained "Cranberry" cherry while the table and bench are in natural walnut. 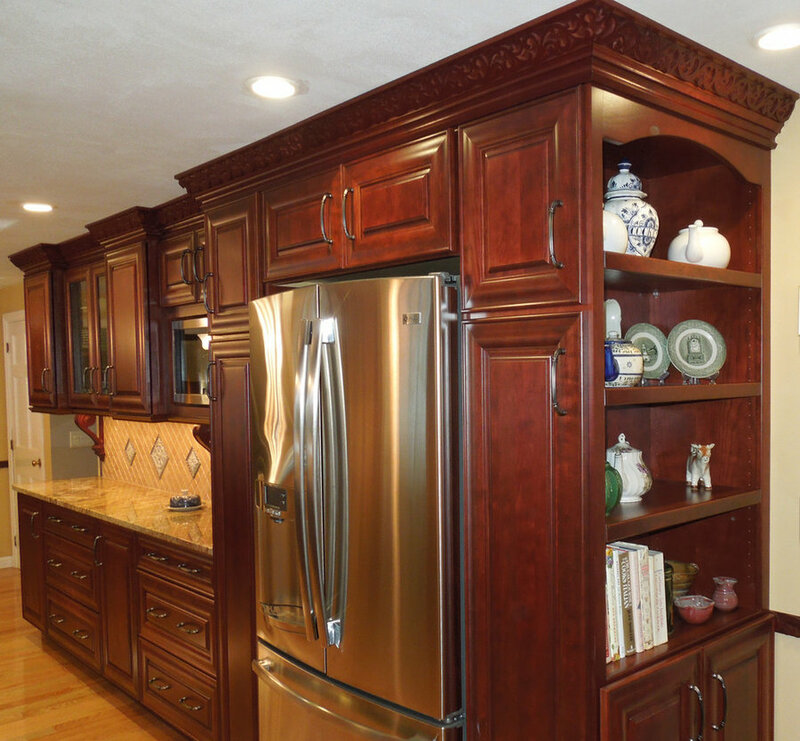 Delicious Kitchens & Interiors, LLC Collections are displayed at the tall cabinet at the end of the refrigerator. Glass doors conceal more treasures in the buffet area of this galley style kitchen. 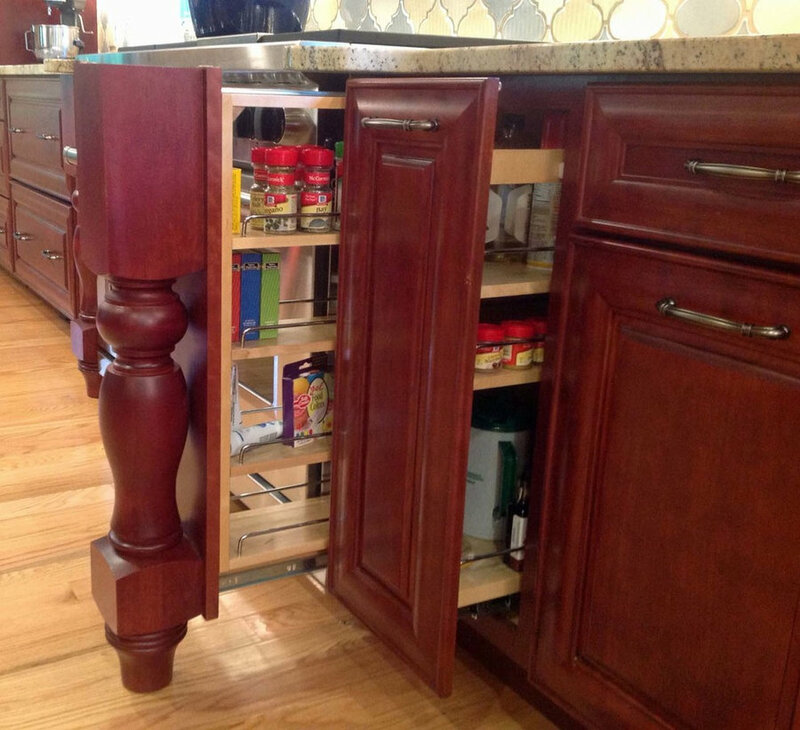 Delicious Kitchens & Interiors, LLC Wood turnings hide the pull-out spice racks which flank a 48" dual-fuel range. 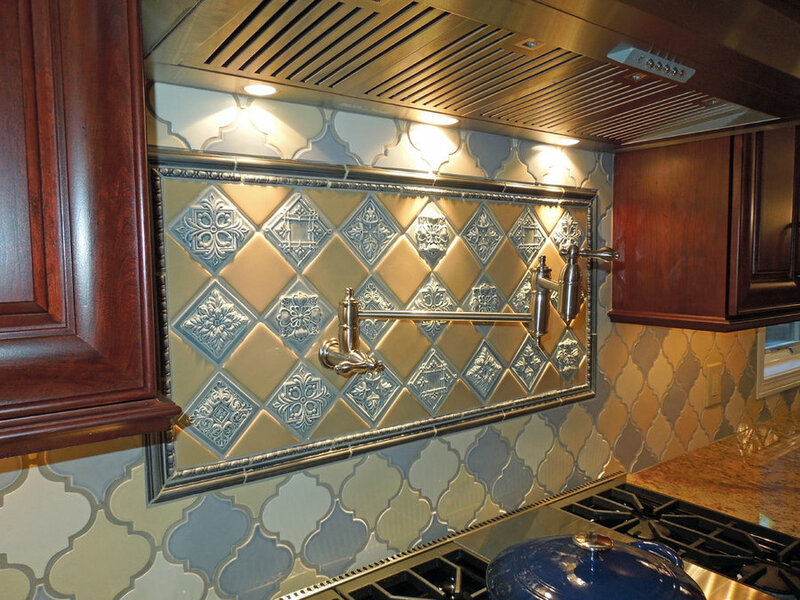 The wall-mounted pot filler pivots from the custom tile layout in this Derry, NH back-splash. 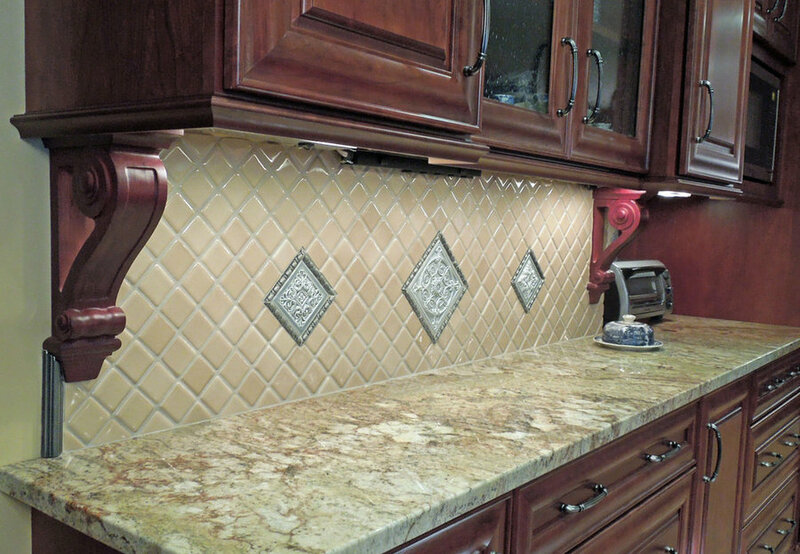 Delicious Kitchens & Interiors, LLC Buffet area features hidden outlets and diamond accent hand-made tiles. 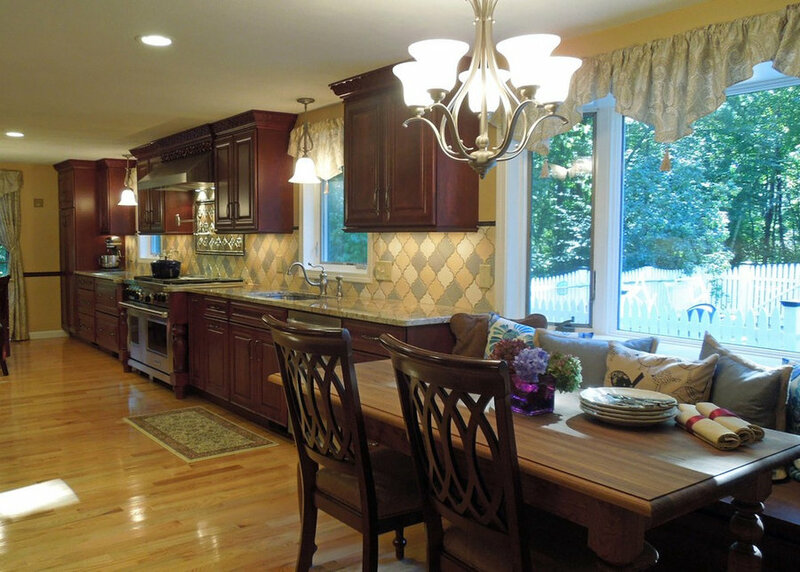 Seeded glass doors conceal china and serving pieces in this Derry, NH classic kitchen. Pot Filler framed with custom tile. Delicious Kitchens & Interiors, LLC Raised panel tiles are framed with two borders creating a dramatic focal point above the range. The hinged pot filler swivels to whichever pot needs filling in this special Derry, NH kitchen. 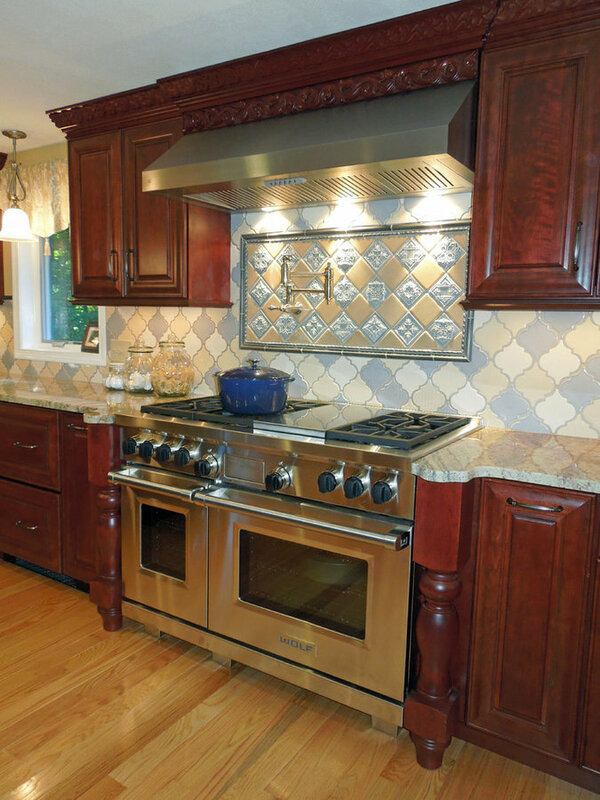 Delicious Kitchens & Interiors, LLC Arabesque tiles in three colors compliment this dramatic Derry, NH kitchen. Grey, cream and white tiles are randomly placed in the back-splash over the Sierra Bordeaux Polished Granite counter. 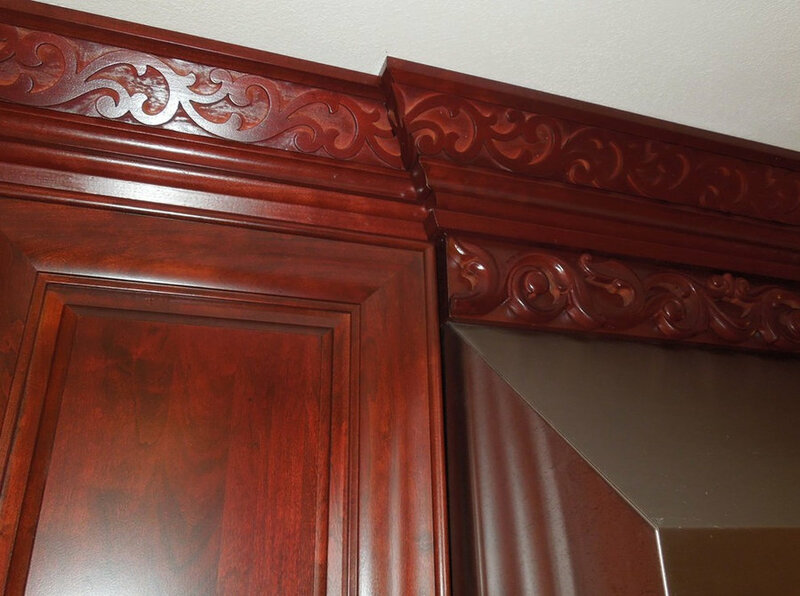 Delicious Kitchens & Interiors, LLC The ornate baroque style molding is highlighted over the range hood with curvy richness in this cherry kitchen located in Derry, NH.